Understanding the risks involved in delivering goods will ensure that you're protected, and help to avoid your profits going down the drain if issues arise. Delivery policies and the legal obligations associated with delivery of goods may sound like something that you just want to shelve for later and hopefully never think about. But, understanding the risks involved in delivering goods to your customers will ensure that you are legally protected, and help to make sure that your hard-earned profits don’t end up down the drain if a legal issue arises. In Part 1 of this article, I covered how contracts of sale are formed, both offline and online, as well as store policies and how to get your customers to agree to them. Make sure you check back to Part 1 for reference, as you need to make sure that your customers are bound by your delivery policy. First, let’s consider some of the differences between physical stores and online stores in terms of the delivery of goods. In a physical store, “delivery” usually occurs at the counter when your customer has paid for the item. They take delivery immediately and walk out the door. If you sell large products such as furniture, you may offer door-to-door delivery for your customers. If so, there are a few legal issues that you may need to consider. As I discussed in Part I of this article, make sure that your delivery policy is displayed in-store prominently and is provided to the customer when they elect to have their goods delivered. 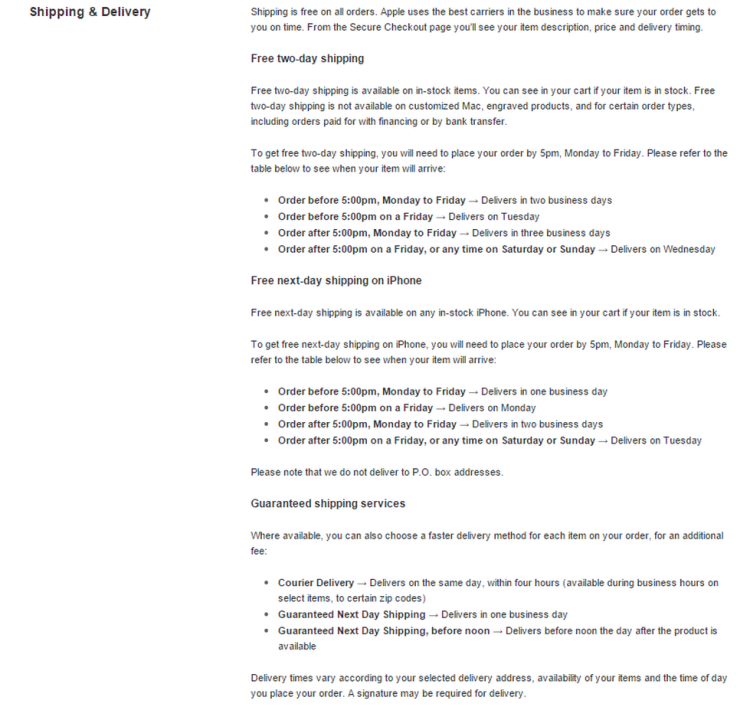 Some of the same issues apply to online delivery as delivery from your physical shop. Let’s take a look. Whether you are running an online store or offer delivery from your physical store, if you are in the U.S., you need to comply with the Mail or Telephone Order Merchandise Rule. This rule applies to orders made over the internet, by phone, by mail, or by fax, and sets out rules and guidelines for making promises about shipment estimates and times, unexpected delays, and refunds. The rule requires that you must have a reasonable basis for stating that your product can ship within a certain time period. So this means you can’t say that your goods will be delivered within one week if you don’t reasonably expect this to be possible. If there are delays with regard to your shipment, you must notify your customers, provide them with an updated shipping estimate, and allow them a chance to cancel and receive a refund. Who owns the goods in transit? In the U.K., ownership passes to the buyer when an unconditional contract for sale and delivery of specific goods in a deliverable state is made. It does not matter if delivery or payment are postponed. This means that the goods must be a specific (identifiable) item, and must be ready for delivery. For the goods to be identifiable they need to have some kind of “individual” nature about them, such as the buyer pointing to a specific item on a shelf in-store, or choosing an item number if they are purchasing online. If this is the case, the buyer owns the goods while they are in transit, unless there is a remaining condition that the seller is required to fulfill. If the seller needs to fulfill a condition, ownership transfers to the buyer when the condition is fulfilled and the buyer is notified. Online, this would be something like sending a confirmation email that the goods are packaged and ready to ship. If the item is not identifiable, ownership of the item cannot pass to the buyer until the item has been identified (e.g. by the seller choosing a specific item in his warehouse). Unidentifiable goods are usually those that are to be manufactured, chosen, or acquired after the contract has been formed. A seller has two stacks of books in their warehouse; one stack has just one copy of a book which is signed by its author and another stack has 100 copies of that book but without signatures. If someone orders a copy with a signature, that book is immediately identifiable because it is the only one in the warehouse with a signature. If someone orders a copy without a signature, it is not identifiable because “their” copy could be any of the 100 unsigned books. The person who orders the book with the signature becomes the owner immediately, but the person who orders the book without the signature only becomes the owner once their copy is pulled out of the stack and set aside for delivery. The law is the same in the U.S. and in the U.K.: Ownership passes to the buyer either when the goods are delivered, or when the goods are identified and intended to be owned by the buyer. The alternative in all of these scenarios is that the buyer and seller can also agree that ownership of the goods will transfer when they intend it to (i.e., they can agree between themselves if they wish to do so). What if the person transporting my goods breaks them? The person or company transporting your goods is usually known as a common carrier or a public carrier. For business purposes, freight companies are usually classified as common carriers. This is in contrast to contract carriers, which are a private business only and usually transport only their own goods (such as a trucking company). Common carriers are usually liable for the goods they carry, with some exceptions, and their liability may vary state by state in the U.S.
One law in the U.S. that applies country-wide is called the Carmack Amendment. It covers common carriers, and limits the liabilities of carriers to loss or damage of the property itself. Carrier liability under the Carmack Amendment is established by proving that the goods were delivered to the carrier in good condition, that they arrived at the place of delivery in damaged condition, and that the amount of damages is measurable. An inherent defect in the goods. Regardless of which country you are based in, usually common carriers have insurance in place to protect them in the event that damage occurs to your goods. However, there may also be exclusions from their policies, so always obtain your own insurance, particularly for big-ticket items. Some carriers may include insurance in their fee, so carefully consider what you are paying for and look for deals on shipping and carrying that include insurance. Make sure you read all insurance policy details and exclusions before signing up. If you are shipping your goods by ship, there are also various maritime laws that may apply to lost goods. Ship smart, and consider all costs, fees, and duties so that you don’t end up with shipping and packaging costs eating away at your profit margins. At TermsFeed, we’ve set up free PDF templates that you can use to get started with a Refund Policy and a Terms and Conditions Agreement to cover your legal obligations. Have you had a particularly good (or bad) experience shipping goods for your business? What did you learn?